This article is about the preservation of cultural heritage. For cultural heritage as a concept, see Cultural heritage. For vocation and practice of managing cultural heritage, see Cultural heritage management. In England, antiquarian interests were a familiar gentleman's pursuit since the mid 17th century, developing in tandem with the rise in scientific curiosity. Fellows of the Royal Society were often also Fellows of the Society of Antiquaries. Many historic sites were damaged as the railways began to spread across the UK; including Trinity Hospital and its church in Edinburgh, Furness Abbey, Berwick and Northampton Castle, and the ancient walls of York, Chester and Newcastle. In 1833 Berkhamsted Castle became the first historic site in England officially protected by statute under the London and Birmingham Railway Acts of 1833–1837, though the new railway line in 1834 did demolish the castle's gatehouse and outer earthworks to the south. Another early preservation event also occurred at Berkhamsted. In 1866, Lord Brownlow who lived at Ashridge, tried to enclose the adjoining Berkhamsted Common with 5-foot (2 m) steel fences in an attempt to claim it as part of his estate. In England from early Anglo-Saxon times, Common land was an area of land which the local community could use as a resource. Across England between 1660 and 1845, 7 million acres of Common land had been enclosed by private land owners by application to parliament. On the night of 6 March 1866, Augustus Smith MP led gangs of local folk and hired men from London's East End in direct action to break the enclosure fences and protect Berkhamsted Common for the people of Berkhamsted in what became known nationally as the Battle of Berkhamsted Common. In 1870, Sir Robert Hunter (later co-founder of the National Trust in 1895) and the Commons Preservation Society succeed in legal action that ensured protection of Berkhamsted Common and other open spaces threatened with enclosure. In 1926 the common was acquired by the National Trust. By the mid 19th century, much of Britain's unprotected cultural heritage was being slowly destroyed. Even well-meaning archaeologists like William Greenwell excavated sites with virtually no attempt at their preservation, Stonehenge came under increasing threat by the 1870s. Tourists were chipping off parts of the stones or carving their initials into the rock. The private owners of the monument decided to sell the land to the London and South-Western Railway as the monument was "not the slightest use to anyone now". John Lubbock, an MP and botanist emerged as the champion of the country's national heritage. In 1872 he personally bought private land that housed ancient monuments in Avebury, Silbury Hill and elsewhere, from the owners who were threatening to have them cleared away to make room for housing. Soon, he began campaigning in Parliament for legislation to protect monuments from destruction. This finally led to the legislative milestone under the Liberal government of William Gladstone of the Ancient Monuments Protection Act 1882. The first government appointed inspector for this job was the archaeologist Augustus Pitt-Rivers. This legislation was regarded by conservative political elements as a grave assault on the individual rights of property of the owner, and consequently, the inspector only had the power to identify endangered landmarks and offer to purchase them from the owner with his consent. The Act only covered ancient monuments and explicitly did not cover historic buildings or structures. In 1877 the Society for the Protection of Ancient Buildings was founded by the Arts and Crafts designer William Morris to prevent the destruction of historic buildings, followed by the National Trust in 1895 that bought estates from their owners for preservation. The Ancient Monuments Protection Act 1882 had only given legal protection to prehistoric sites, such as ancient tumuli. The Ancient Monuments Protection Act 1900 took this further by empowering the government's Commissioners of Work and local County Councils to protect a wider range of properties. Further updates were made in 1910. 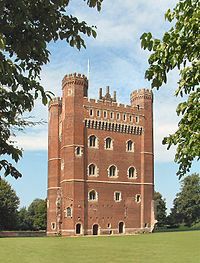 Tattershall Castle, Lincolnshire, a medieval manor house had been put up for sale in 1910 with its greatest treasures, the huge medieval fireplaces, still intact. However, when an American bought the house they were ripped out and packaged up for shipping. The former viceroy of India, George Curzon, 1st Marquess Curzon of Kedleston, was outraged at this cultural destruction and stepped in to buy back the castle and reinstall the fireplaces. After a nationwide hunt for them they were finally found in London and returned. He restored the castle and left it to the National Trust on his death in 1925. His experience at Tattershall influenced Lord Curzon to push for tougher heritage protection laws in Britain, which saw passage as the Ancient Monuments Consolidation and Amendment Act 1913. The preservation for the benefit of the Nation of lands and tenements (including buildings) of beauty or historic interest and, as regards lands, for the preservation of their natural aspect, features and animal and plant life. Also the preservation of furniture, pictures and chattels of any description having national and historic or artistic interest. In the early days, the Trust was concerned primarily with protecting open spaces and a variety of threatened buildings; its first property was Alfriston Clergy House and its first nature reserve was Wicken Fen. Its first archaeological monument was White Barrow. The focus on country houses and gardens, which now comprise the majority of its most visited properties, came about in the mid 20th century, when it was realised that the private owners of many of these properties were no longer able to afford to maintain them. The Town and Country Planning Act 1944 and the Town and Country Planning Act 1990 took steps toward historic preservation on an unprecedented scale. Concern about the demolition of historic buildings arose in institutions such as the pressure group the Society for the Preservation of Historic Buildings, which appealed against demolition and neglect on a case by case basis. English Heritage formed in 1983, is a registered charity that looks after the National Heritage Collection in England. This comprises over 400 of England's historic buildings, monuments and sites spanning more than 5,000 years of history. Within its portfolio are Stonehenge, Dover Castle, Tintagel Castle and the best preserved parts of Hadrian's Wall. Originally English Heritage was the operating name of an executive non-departmental public body of the British Government, officially titled the Historic Buildings and Monuments Commission for England, that ran the national system of heritage protection and managed a range of historic properties. It was created to combine the roles of existing bodies that had emerged from a long period of state involvement in heritage protection. In 1999 the organisation merged with the Royal Commission on the Historical Monuments of England and the National Monuments Record (England), bringing together resources for the identification and survey of England's historic environment. On 1 April 2015, English Heritage was divided into two parts: Historic England, which inherited the statutory and protection functions of the old organisation, and the new English Heritage Trust, a charity that would operate the historic properties, and which took on the English Heritage operating name and logo. The British government gave the new charity an £80 million grant to help establish it as an independent trust, although the historic properties remained in the ownership of the state. In the United States one of the first historic preservation efforts was the Washington's Headquarters State Historic Site, in Newburgh, New York. This property has the distinction of being the first-ever property designated and operated as a historic site by a U.S. state, having been so since 1850. Another early historic preservation undertaking was that of George Washington's Mount Vernon in 1858. Founded in 1889, the Richmond, Virginia-based Preservation Virginia (formerly known as the Association for the Preservation of Virginia Antiquities) was the United States' first statewide historic preservation group. The American Scenic and Historic Preservation Society was formed in 1895 as the first American organization of its kind in the United States that did not limit its activities to a single historic place or object. The Society operated as a national organization to: protect the natural scenery and the preservation of historic landmarks; to preserve landmarks and records of the past or present; to erect memorials and promote appreciation of the scenic beauty of America. Charles E. Peterson was an influential figure in the mid-20th century establishing the Historic American Buildings Survey (HABS), advising on the establishment of Independence National Historical Park, helping with the first graduate degree program in historic preservation in the United States at Columbia University, and author. The architectural firm of Simons & Lapham (Albert Simons and Samuel Lapham) was an influential supporter of the nation's first historic preservation ordinance in Charleston, South Carolina in 1930, affording that city a regulatory means by which to prevent the destruction of its historic building stock. In 1925, efforts to preserve the historic buildings of the French Quarter in New Orleans led to the creation of the Vieux Carré Commission and later, to the adoption of a historic preservation ordinance. The preservation of this historic building in Washington, D.C. resulted in an award for Excellence in Historic Preservation by the local government. The US National Trust for Historic Preservation, another privately funded non-profit organization, began in 1949 with a handful of structures and has developed goals that provide "leadership, education, advocacy, and resources to save America's diverse historic places and revitalize our communities" according to the Trust's mission statement. In 1951 the Trust assumed responsibility for its first museum property, Woodlawn Plantation in northern Virginia. Twenty-eight sites in all have subsequently become part of the National Trust, representing the cultural diversity of American history. In New York City, the destruction of Pennsylvania Station in 1964 shocked many nationwide into supporting preservation. The 1960s proved advantageous with new laws and international agreements extending preservation "from ancient monuments to whole districts and buildings a few decades old." On an international level, the New York-based World Monuments Fund was founded in 1965 to preserve historic sites all over the world. Under the direction of James Marston Fitch, the first advanced-degree historic preservation program began at Columbia University in 1964. It became the model on which most other graduate historic preservation programs were created. Many other programs were to follow before 1980: M.A. in Preservation Planning from Cornell (1975); M.S. in Historic Preservation from the University of Vermont (1975); M.S. in Historic Preservation Studies from Boston University (1976); M.S. in Historic Preservation from Eastern Michigan University (1979) and M.F.A. in Historic Preservation was one of the original programs at Savannah College of Art & Design. James Marston Fitch also offered guidance and support towards the founding of the Master of Preservation Studies Degree within the Tulane School of Architecture in 1996. The M.Sc. in Building Conservation degree program is offered by the School of Architecture at Rensselaer Polytechnic Institute in Troy, New York. In 2005, Clemson University and the College of Charleston created an M.S. degree program based in Charleston, SC. The first undergraduate programs (B.A.) appeared in 1977 from Goucher College and Roger Williams University (then called Roger Williams College), followed by Mary Washington College in 1979. As of 2013[update] there were more than fifty historic preservation programs offering certificates, associate, bachelor's, and master's degrees in the United States. In Canada, the phrase "heritage preservation" is sometimes seen as a specific approach to the treatment of historic places and sites, rather than a general concept of conservation. "Conservation" is taken as the more general term, referring to all actions or processes that are aimed at safeguarding the character-defining elements of a cultural resource so as to retain its heritage value and extend its physical life. Historic objects in Canada may be granted special designation by any of the three levels of government: the central government, the provincial governments, or a municipal government. The Heritage Canada Foundation acts as Canada's lead advocacy organisation for heritage buildings and landscapes. Victor de Stuers is widely considered the man who started historic preservation in the Netherlands. In 1875 the first national department for conservation was established and de Stuers was appointed as the first legal secretary at the Ministry of Home Affairs as chief of the brand new Department of Arts and Sciences. He was the driving force behind Monumentenzorg (Foundation for Historic Preservation), helped found the Rijksmuseum (National Museum) and the Rijksarchief (National Archives). However, it was not until the 20th century that there was national legislation on historic preservation. In 1961 the Monumentenwet (“Monuments Act”) was passed. It defined that any physical building or space that was at least fifty years old and “which are of general interest because of their beauty, their meaning to science or their social value” and must thus be preserved. In 1988 this Act was replaced by the Monumentenwet 1988 (“Monuments Act 1988”) and in 2015 by the Erfgoedwet (“Heritage Law”). In 1973, the NGO Monumentenwacht (“Monument Watch”) was founded with the purpose of providing preventative measures of maintenance for historic buildings. As the majority of the historic preservation programs in the Netherlands, this program is decentralized, managed on the provincial level. Owners of heritage buildings can subscribe to the services of Monumentenwacht and receive regular visits for inspection. The costs are covered through a combination of national and provincial subsidies. A special kind of preservation that takes place in the Netherlands is the preservation of maritime heritage. Maritime trade was the Dutch specialty which shaped much of their culture and as a country that is 50% under sea level the Dutch history is closely intertwined with water. There are maritime museums in both Amsterdam and Rotterdam that tell the story of the Dutch maritime heritage, but there is not much legal documentation on how to preserve it. For example, according to Sarah Dromgoole,  shipwrecks from The Dutch East India Company are found all around the world, which are still property of the Netherlands, but the Dutch government rarely takes responsibility for this property that is found outside of their territory. In Macedonia, historic preservation falls under the overarching category of cultural heritage preservation according to the Law on Protection of Cultural Heritage (Закон за заштита на културното наследство). According to this law, which the Macedonian Parliament approved in March 2004, there are three types of cultural heritage: immovable, movable, and intangible. Historical preservation is represented by the protection of monuments and monumental entireties under immovable cultural heritage, and historical items under movable cultural heritage. Although this Law was the first nation-wide establishment of regulations for historic preservation since the Republic of Macedonia gained independence from Yugoslavia on September 8, 1991, several organizations throughout the 20th century have encompassed efforts of historic preservation. The “Central office for protection of cultural monuments and natural rarities of the Socialist Republic of Macedonia” has existed since 1949. In 1960, the Central Office was renamed to “National office for protection of cultural monuments”, and granted the status of an independent cultural institution, with authority to execute activities of historic preservation. After the establishment of the Law on Protection of Cultural Heritage in 2004, the Ministry of Culture once again renamed the office to “National center for conservation” and narrowed down its responsibilities to dealing solely with preservation of immovable cultural heritage. Other organizations which have contributed to the efforts of historic preservation are the Macedonian National Committee of ICOMOS and the NI Institute for Protection of Monuments of Culture and Museum-Ohrid. The International Council on Monuments and Sites (ICOMOS) established their branch in Macedonia in 1995 through the initiative of 43 conservationists from Macedonia. The guiding principles of the Macedonian National Committee of ICOMOS are raising the national consciousness about the importance of historic and cultural heritage, decentralization of the discourse about heritage, and effective monitoring of the status of cultural and historic heritage in the country. The NI Institute for Protection of Monuments of Culture and Museum - Ohrid is the second oldest institutions for historical preservation established in 1952. In 1956 the Institute was granted authority to protect movable and immovable cultural and historic heritage in the Ohrid region. The Institute has since executed numerous efforts for historic preservation, most notably aiding the recognition of the city of Ohrid as a UNESCO site of cultural heritage in 1979. In Israel, there are currently two laws concerning historic preservation, Antiquities Law of the State of Israel (1978) and Planning and Building Law (1965). Both laws were adapted from the British law that was implemented during the British Mandate of Palestine. However, these laws are not comprehensive and limited in scope: the Antiquities Law only applies itself to buildings or artifacts dated before 1700 BC. So while efforts discovering and protecting anything older than 1700 BC are well protected, anything from later historical periods is not under the protection of this law. The Planning and Building Law discusses the overall management and regulation of land use in Israel. It has been through several changes and amendments specifically regarding preservation, but over the years it hasn't been enforced and many historical sites were destroyed, as the state was prioritizing developmental and economic interests. During the 1960s, the issue of preservation was gaining public awareness, and as a response to the destruction of Herzliya Hebrew Gymnasium (one of the first educational institutions in Israel) in 1959, a wave of shock and anger led to extensive public debate. In 1984, The Council for Conservation of Heritage Sites in Israel was established, at the recommendation of the Knesset and the Committee of Education. Its aims include locating remains of historic settlements, protect and conserve them as well as developing conservation principles that are specific to Israel’s historic situations and are aligned with international standards. The council used to operate under the Society for the Protection of Nature in Israel but in 2008 registers as an independent non-profit. Today, it is the organization responsible for the most historical preservation endeavors as well as efforts to add amendments to existing laws to provide a comprehensive and effective framework for preservation in Israel. A different, separate effort in preservation comes from the Israeli Defense Force (IDF). The IDF surveyed 94 military bases and found that about 80 of them include sites worth preserving, and for each of these bases there is a preservation plan. The IDF is working towards maintaining these building as well as communicating their value to the soldiers in these bases. Buildings include Knights Templar sites, old military bases used by the British or German or buildings from the Ottoman period. A historic district in the United States is a group of buildings, properties, or sites that have been designated by one of several entities on different levels as historically or architecturally significant. Buildings, structures, objects and sites within a historic district are normally divided into two categories, contributing and non-contributing. Districts greatly vary in size, some having hundreds of structures while others have just a few. The U.S. federal government designates historic districts through the U.S. Department of Interior, under the auspices of the National Park Service. Federally designated historic districts are listed on the National Register of Historic Places. Historic districts allows rural areas to preserve their characters through historic preservation programs. These include "Main Street" programs that can be used to redevelop rural downtowns. Using historic preservation programs as an economic development tool for local governments in rural areas has enabled some of those areas to take advantage of their history and develop a tourism market that in turn provides funds for maintaining an economic stability that these areas would not have seen otherwise. A similar concept exists in the United Kingdom: a Conservation area is designated in accordance with the Planning (Listed Buildings and Conservation Areas) Act 1990 in order to protect a zone in which there are buildings of architectural or cultural heritage interest. In 1835, the English poet William Wordsworth described the Lake District as a "sort of national property, in which every man has a right and interest who has an eye to perceive and a heart to enjoy." It was, however, the United States that led the world in the creation of National Parks, areas of unspoiled natural wilderness, where the intrusion of civilization are intentionally minimal. The Department of the Interior designated several areas of Morristown, New Jersey as the first historic park in the United States national park system. It became designated as the Morristown National Historical Park. The community had permanent settlements that date to 1715, is termed the military capital of the American Revolution, and contains many designations of sites and locations. The park includes three major sites in Morristown. In the United Kingdom, James Bryce the ambassador to the US praised the system of National Parks and campaigned to have them introduced in Great Britain. Little came of it until mounting public pressure during the early 20th century from the Ramblers' Association and other groups led to the National Parks and Access to the Countryside Act 1949. According to UNESCO’s 1972 World Heritage Convention, landscapes and sites of outstanding universal value can be designated as World Heritage Sites. The World Heritage Convention encompasses historic preservation under the category of “cultural heritage”. According to Article 1 of the Convention, monuments, groups of buildings, and sites “which are of outstanding universal value from the point of view of history, art or science” are to be designated cultural heritage. A requirement of such designation is that the designating nation has appropriate legal, scientific, technical, administrative and financial measures in place to identify, protect, conserve, present, and rehabilitate world heritage sites. However, according to Article 6 of the Convention, while sovereignty of the State where the site is located is not to be compromised, the State acknowledges that protection of heritage sites is a duty of the entire international community. The World Heritage convention’s counterpart, The World Heritage Committee, is the body responsible for the practical implementation of the Convention as well as managing and deciding how to use the World Heritage Fund. The Committee also gets to have the final say when determining whether a property will be included in the World Heritage List. The Committee meets once a year and includes representatives from 21 states that are part of the States Parties. Yearly reports are available to the public on the World Heritage website and include outlines of decisions made, outcomes, working documents and various reports. Although preservation efforts can have benefits for the owners of historical buildings, such as tax cuts and subsidies, there are also drawbacks. One such drawback is that after a neighborhood has been designated to be historically preserved, there is less construction. On the long term this can affect the value of property and investment in housing, both in the neighborhood itself and the neighborhoods directly surrounding it. A second concern that has been raised is that buildings that need to be historically preserved are sometimes still inhabited. In some cases their inability to make changes to the building can lead to dangerous or unhealthy situations for residents. It is not true that nothing could be changed or renovated, but the owner of the building would need to ask permission at the appropriate preservation society, slowing the process down severely. The exact policies are country dependent. Eugène Viollet-le-Duc (1814-1879): French architect who restored Gothic buildings and believed that restoration could improve on the past. Ann Pamela Cunningham (1816–1875): influential in saving Mount Vernon (plantation) from demolition and founding the Mount Vernon Ladies' Association, one of the first preservation organizations in the United States (est. 1854). John Ruskin (1819-1900): English art critic who established the basic theory of preservation (retention of status quo). Augustus Pitt Rivers (1827–1900): Britain's first Inspector of Ancient Monuments. John Lubbock (1834-1913): campaigned for legal protection for ancient monuments and saved Avebury from destruction at the hand of its private owners. William Morris (1834-1896): English designer and writer who founded the Society for the Protection of Ancient Buildings. Victor de Stuers (1843-1916): Dutch art historian, lawyer, civil servant and politician. First legal secretary at the Ministry of Home Affairs as chief of the brand new Department of Arts and Sciences. George Curzon (1859-1925): British Viceroy of India who preserved Tattershall Castle, Lincolnshire and was an influential sponsor of the Ancient Monuments Consolidation and Amendment Act 1913. William Sumner Appleton (1874-1947): Founder of the Society for the Preservation of New England Antiquities (now Historic New England) in 1910, and widely considered as the U.S.'s first professional preservationist. Charles E. Peterson (1906–2004): considered to be the "founding father" of historic preservation in the United States. James Marston Fitch (1909-2000): educator, author, critic and design practitioner made a major contribution to the philosophical basis of the modern preservation movement and trained and inspired generations of preservationists. William J. Murtagh: first Keeper of the National Register of Historic Places in the United States and significant contributor to the literature of the discipline. Lee H. Nelson: worked for Charles E. Peterson at the National Park Service's Historic American Buildings Survey and helped to formulate national policies on historic preservation. Walter Muir Whitehill: Chairman of the Whitehill Report in the late 1960s, which established the first guidelines for higher education historic preservation programs. Richard Nickel: American preservationist who saved architectural elements from Louis Sullivan buildings. Although volunteers continue to play a large role in historic preservation activities, the field has seen an increased level of professionalization. Today, there are many career options in historic preservation in the public, non-profit and private sectors. Institutes of secondary education (universities, colleges, etc.) in the United States offer both certificate and degree (A.A.S, B.A., B.F.A., B.S., M.A., M.F.A., M.D.S, M.H.P., M.S., and PhD) programs in historic preservation. Some pupils—at schools with such programmes available—choose to enroll in "joint degree" programs, earning a degree in historic preservation along with one in another, related subject, often an MArch, MUP or JD degree. Focus specifically on the physical conservation of building materials. Primarily researches and writes statements expressing the historical significance of sites. Most are employed by local, county, state or federal government planning agencies to administer tax abatement programs, ensure compliance with local ordinances and state and Federal legislation, and conduct design reviews to ensure that proposed projects will not harm historic and archaeological resources. At the state level, they are known as a State Historic Preservation Officer while at other levels of government they may be known as a Federal or Tribal Historic Preservation Officer. Some may also serve as consultants to local governments, conducting Section 106 reviews in accordance with the National Historic Preservation Act of 1966. Design and develop architectural conservation plans and work specifications in consultation with Engineers, Historians and Planners, ensuring compliance with local design guidelines to protect sensitive historic building fabric. Most are employed by private architecture firms though some find work with government agencies. Employs knowledge of traditional building techniques and contemporary conservation technologies to complete the conservation, repair or restoration of historic buildings. Work with Architects to devise conservation solutions of a structural or material -specific nature. Most are employed by private architecture and/or engineering firms. Most are employed by government agencies and private foundations to interpret the significance of historic resources for the general public. Engage in a variety of activities concerned with historic preservation advocacy, easements, and private foundations at the local, regional, statewide, or national levels. ^ Michael Wheeler (1 January 1995). Ruskin and Environment: The Storm-cloud of the Nineteenth Century. Manchester University Press. pp. 125–. ISBN 978-0-7190-4377-2. ^ Cobb 1883, p. 26. ^ Sherwood 2008, p. 245. ^ Denise Winterman. "The man who demolished Shakespeare's house". BBC News Magazine. ^ Adrian Pettifer (2002). English Castles: A Guide by Counties. Boydell & Brewer. pp. 145–7. ^ "The National Trust Acts 1907 - 1971, as varied by a Parliamentary Scheme implemented by The Charities (National Trust) Order 2005" (PDF). National Trust. p. 4. Retrieved 10 November 2017. ^ "The Society for the Preservation of Historic Buildings (SPHB)". sphb.org.uk. Archived from the original on 2008-08-21. Retrieved 2012-10-29. ^ a b "Our History". English Heritage. English Heritage Trust. Retrieved 6 April 2015. ^ Lean, Geoffrey (28 February 2015). "Does our history have a future in the hands of the English Heritage Trust?". The Telegraph. Retrieved 6 April 2015. ^ Helium Studio. "Preservation Virginia". Apva.org. Archived from the original on 2012-10-08. Retrieved 2012-10-29. ^ Lindgren, James Michael. Preserving the Old Dominion: historic preservation and Virginia traditionalism. Charlottesville: University Press of Virginia, 1993. 3. Print. ^ "Scenic and Historic America: Bulletin of the American Scenic and Historic Preservation Society." ASHPS 2.1 (March 1930):3. ^ Ellis, Scott S. (2010). Madame Vieux Carré: the French Quarter in the Twentieth Century. University of Mississippi. p. 43. ^ "Mayor Gray Announces Winners of Historic Preservation Awards". Government of the District of Columbia. Retrieved October 22, 2014. ^ Murtagh, William J. Keeping Time: The History and Theory of Preservation in America. New York: Sterling Publishing, Co., 1997. ^ Michael Tomlan. "Historic Preservation Education: Alongside Architecture in Academia." Journal of Architectural Education, Vol. 47, No. 4. (1994): 187-196. ^ "Tulane School of Architecture -". architecture.tulane.edu. ^ "Master of Preservation Studies". Tulane School of Architecture. ^ "Home Page". 13 September 2015. ^ "Dictionary of Art Historians". arthistorians.info. Retrieved 2017-11-08. ^ "Victor de Stuers, vader van Monumentenzorg en Rijksmuseum - Kerk in Den Haag". www.kerkindenhaag.nl (in Dutch). Retrieved 2017-11-08. ^ Lunsingh Scheurleer, Th. H. (12 November 2013). "Stuers, jhr. Victor Eugène Louis de (1843-1916)". ^ DBNL. "J.A.C. Tillema, Schetsen uit de geschiedenis van de monumentenzorg in Nederland · dbnl". DBNL (in Dutch). Retrieved 2017-11-08. ^ Howard, Peter; Ashworth, Gregory John (1999). European Heritage, Planning and Management. Intellect Books. ISBN 9781841500058. ^ "wetten.nl - Regeling - Monumentenwet 1988 - BWBR0004471". wetten.overheid.nl (in Dutch). Retrieved 2017-11-08. ^ "Erfgoedwet". Rijksdienst voor het Cultureel Erfgoed (in Dutch). 2014-08-25. Retrieved 2017-11-08. ^ "Devlin, H. (2005). European initiatives in preventative maintenance for historic buildings. Retrieved from www.wcmt.org.uk" (PDF). ^ Weaver, Martin E. (1986). "Historic Preservation Maintenance in the Netherlands: The Monumentenwacht". Bulletin of the Association for Preservation Technology. 18 (18): 10–11. doi:10.2307/1494114. JSTOR 1494114. ^ Bouwer, L.M. ; Vellinga, P. (20 October 2018). Flood Risk Management in Europe. Springer Netherlands. pp. 469–484. doi:10.1007/978-1-4020-4200-3_24. ^ Dromgoole, Sarah (2006-06-30). The Protection of the Underwater Cultural Heritage: National Perspectives in Light of the UNESCO Convention 2001 - Second Edition. BRILL. ISBN 9789047410454. ^ Jovcevska, Biljana. “Abstract” (PDF). ftu.uklo,edu.mk (in Macedonian). Retrieved 2017-11-08. ^ “ICOMOS Macedonia About Us”. icomos.org.mk (in Macedonian). Retrieved 2017-11-08. ^ “Историја”. НУ Завод за Заштита на Спомениците на Културата и Музеј - Охрид. (in Macedonian). Retrieved 2017-11-08. ^ "Cultural Heritage in South-East Europe: Macedonia (Former Yugoslav Republic of)" (PDF). "Cultural Heritage in South-East Europe" Series - N°, UNESCO. Retrieved 2017-11-08. ^ "חוק מדינת ישראל". main.knesset.gov.il. ^ "Summay of the law in English". ^ Klein Halevi, Yossi (2011). האמרקניזציה של תל אביב. ^ "From the Council for Conservation of Heritage Sites". ^ "From the Council for Conservation of Heritage Sites: Historical context on the Council's work and outline of future plans [Hebrew]". ^ Stenberg, Peter L. (October 1995). "Historic Preservation as Part of Downtown Redevelopment." Rural Development Perspectives, Vol. 11, no.1, pp. 16-21. Washington, DC : Economic Research Service. Retrieved December 30, 2008. ^ John, Patricia LaCaille (July 2008). "Historic Preservation Resources." Archived 2008-05-11 at the Wayback Machine Rural Information Center Publication Series no. 62. National Agricultural Library. Rural Information Center. Retrieved December 30, 2008. ^ "Morristown National Historical Park - Morristown National Historical Park". Nps.gov. 2012-10-12. Retrieved 2012-10-29. ^ Centre, UNESCO World Heritage. "Convention Concerning the Protection of the World Cultural and Natural Heritage". whc.unesco.org. Retrieved 2017-11-09. ^ Been, Vicki; Gould Ellen, Ingrid; Gedal, Michael; Glaeser, Edward; McCabe, Brian J. "Preserving History or Hindering Growth? The Heterogeneous Effects of Historic Districts on Local Housing Markets in New York City" (PDF). ^ Li, C. (2012). The politics and heritage of race and space in San Francisco’s Chinatown. In D. F. Ruggles (Ed. ), On location (pp. 37–59). New York, NY: Springer. ^ Barrett, J. (2016). Getting Away From "No": Straight Talk to Local Advocates. Forum Journal 30(2), 46-49. National Trust for Historic Preservation. Retrieved November 7, 2017, from Project MUSE database. ^ "Biography of Ann Pamela Cunningham" Archived 2010-04-10 at the Wayback Machine National Women's History Museum. Retrieved 21 April 2010. Cobb, John Wolstenholme. Two Lectures on the History and Antiquities of Berkhamsted. London, UK: Nichols and Sons * Jokilehto, Jukka. A History of Architectural Conservation. Oxford, UK: Butterwort/Heinemann, 1999. Fitch, James Marston. Historic Preservation: Curatorial Management of the Built World. Charlottesville, VA: University Press of Virginia, 1990. * Munoz Vinas, Salvador. Contemporary Theory of Conservation. Amsterdam: Elsevier/Butterworth Heinemann, 2005. Sherwood, Jennifer. "Influences on the Growth of Medieval and Early Modern Berkhamsted". In Wheeler, Michael. A County of Small Towns: the Development of Hertfordshire's Urban Landscape to 1800. Hatfied, UK: Hertfordshire. Tyler, Norman, Ted J. Ligibel, and Ilene R. Tyler. Historic Preservation: An Introduction to its History, Principles, and Practice. New York: W.W. Norton & Company, 2018. Wikimedia Commons has media related to Heritage preservation.